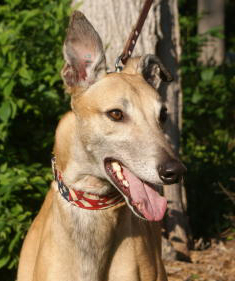 Joshua was a favorite of his racing owner and he has a great friendly personality that makes him stand out in a crowd of greyhounds. He was a fantastic racer too entering stakes races and winning AA races at a top level track. Just a great guy with personality and racing skill. He raced at Southland in Arkansas and Wheeling in WV and has 129 races listed. He raced at 78lbs and his DOB is Sept 14 2008. His sire is Flying Penske and his dam is Secrets Told. He is doing great in foster care and adjusting well to living in a house. He did great on his potty training He passed his cat and small dog tests so should be fine to live with either. He might be a good apartment dog since he potties on leash and is quiet in his crate. Be sure to look at his other pictures to see a really cute one that shows how sweet he is when he was telling his trainer at the track goodbye.